"Howwwwieeee! There's a player I like. Can we keep him?" 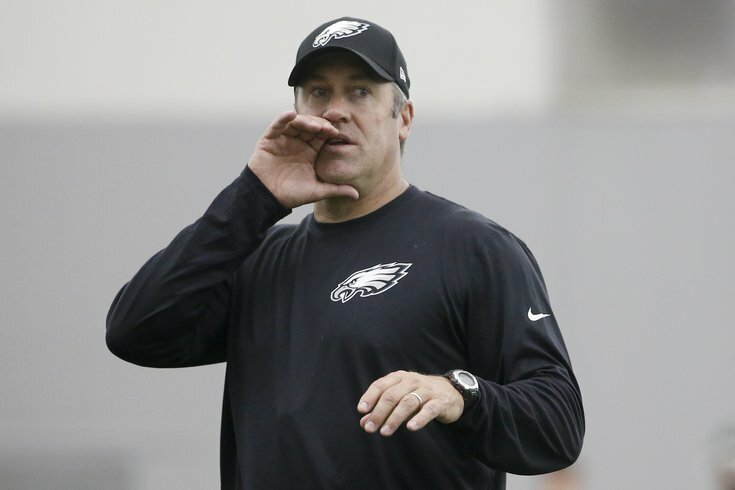 Since the Philadelphia Eagles will not see the practice field again for another six-seven weeks, let's go ahead and project the roster based on what we saw throughout OTAs and minicamp. There's a good chance that Carson Wentz won't even be active on gameday initially while he learns the ropes in the NFL, which is fine. Maybe the Eagles will add a veteran running back before the start of training camp, but from what I've seen so far throughout OTAs and minicamp, I can't justify keeping four of the backs currently on the roster. Not to worry. The 2017 RB draft class is loaded. Nelson Agholor's "situation" adds more question marks to an already nonthreatening group of receivers. Josh Huff has dropped a boatload of passes this spring, but we'll project him to survive. The first three tight ends are locks. Meanwhile, Chris Pantale was the pleasant surprise of spring practices, as he made several difficult catches and is getting the majority of the reps whenever the Eagles use a fullback. The offensive line is the toughest call on the team at this point. Allen Barbre could start, but he'll have still competition in training camp from Stefen Wisniewski and Isaac Seumalo in training camp. I'm betting on Wisniewski winning that job, although not with a lot of confidence. Doug Pederson pointed out clearly that Seumalo will be working at left guard, but for the purposes of keeping the depth chart below neat and tidy, we'll slot him in behind Jason Kelce at center. Barbre and Matt Tobin serve as backups who can play four of the five positions along the offensive line. Mike Martin has gotten reps with the ones while Fletcher Cox observed from the sidelines in minicamp. The player most in danger here would be Taylor Hart if the Eagles get an undrafted free agent to step up his game in camp. The Eagles lack depth in quantity at linebacker, but the starters are set. If there's one undrafted free agent to bet on to make the 53-man roster, I would go with Myke Tavarres. To begin, one starting job at this point is Leodis McKelvin's to lose. I would go so far as to pencil him in as CB1. I also believe Jim Schwartz imported Ron Brooks for a reason. I like his chances of being the primary slot corner better than JaCorey Shepherd's. A big question that has emerged this spring is whether or not second year player Eric Rowe will earn a starting job. He played well last season, but he's not a shoe-in to beat out Nolan Carroll or even rookie Jalen Mills. For now, we'll project him to show well in training camp, but he has a battle on his hands. That sixth corner spot is anyone's guess. Denzel Rice had a good spring in my view, so we'll give him the temporary nod over Shepherd. The starters are set with Malcolm Jenkins and Rodney McLeod, who Jim Schwartz thinks could be among the best safety tandems in the NFL. The Eagles will also keep Blake Countess, who like Jalen Mills above has cornerback/safety versatility, and special teams stud Chris Maragos. The kicker battle will be a fun thing to evaluate this summer. I'll guess on Cody Parkey for now, while the other two specialist spots feel set.